Seeker's Bad Science podcast explores the surprisingly complex scientific principles in Pixar's 2008 computer-animated sci-fi classic. In 2008, Pixar Animation Studios released the sci-fi parable WALL-E, considered by many genre connoisseurs to be among the very best computer-animated films ever made. 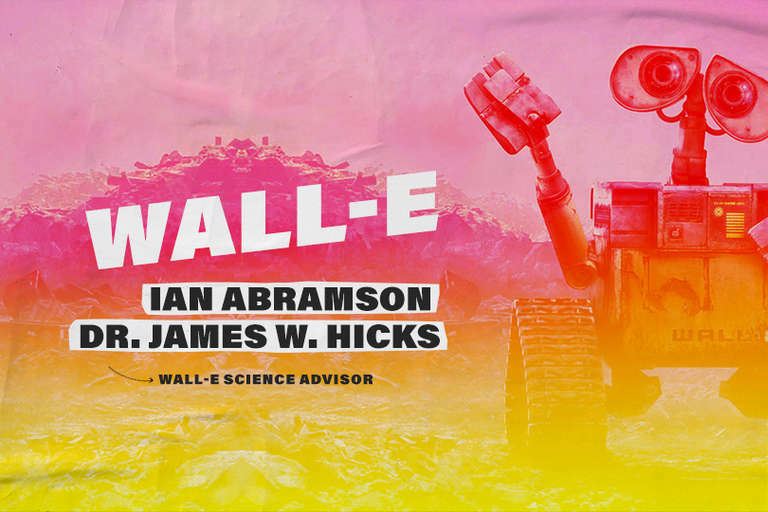 Besides being funny and visually dazzling, WALL-E does what good science fiction is supposed to do — it takes present-day issues and extrapolates them out to the event horizon. In the case of WALL-E, the central issue is America's unsustainable obsession with material consumption and what that means for the future of our planet and our species. In the future, humans have abandoned Earth due to radical pollution problems. The planet's surface is piled high with trash, the atmosphere is choked with smog, and a cloud of orbiting space garbage blots out the stars. In search of a new home planet, a delegation from humanity sets out in a generation starship on a trip that lasts 700 years. In this week's installment of Bad Science, Seeker's podcast on science versus fiction at the movies, host Ethan Edenburg is joined by James Hicks, one of the original science advisers on WALL-E and a professor of ecology and evolutionary biology at the University of California, Irvine. Also on hand to think out loud and crack wise is comedian Ian Abramson. As Hicks explains in this week's episode, part of his work on the film was to speculate on what human beings might look like after spending 700 years in space. Fans of the film will recall that the story's human characters are terminally obese and very nearly immobile. In fact, Hicks did the math to estimate the physiological changes that would happen to long-term pilgrims in space. Previous data suggests humans lose muscle mass and bone density at a rate of about two percent per month, so Hicks multiplied that out over several years and generations to arrive at the body shape of the film's future colonists. Hicks also delves into the real-world programs developed by NASA and other space agencies to counteract the effects of microgravity environments. A big part of that, it turns out, is simply doubling down on terrestrial physical therapy regimens that have already proven effective here on Earth — cardiovascular exercise and resistance training. “You can't change your chronological age, but you can change your physiological age,” Hicks says. Also in this week's episode, host Edenburg leads the panel through a series of sound clips from the film, exploring various audio elements with WALL-E designer Ben Burt — the legendary sound man behind blockbuster franchises including Star Wars and Indiana Jones. If you've ever wanted to know how Hollywood typically makes the sound of laser guns … well, you'll want to tune into this week's game: It Doesn't Burt to Know About Sound Design. Click on over for more facts and figures on the surprisingly sophisticated science behind WALL-E, including some intriguing details on mitochondria, epigenetics, and phenotypic plasticity.